Being in The United States of America has been a wonderful experience so far. The scenery is awesome, magnificent, breathtaking. And the people are very friendly, always in for a chat, always ready to help, especially in restaurants when trying to decide what I can eat with my lactose intolerance. All the cream and milk and cheese are dangling before my nose but I can’t touch them. And I miss my daily green smoothies hehehe. Just a small update on the road. Have a wonderful time! 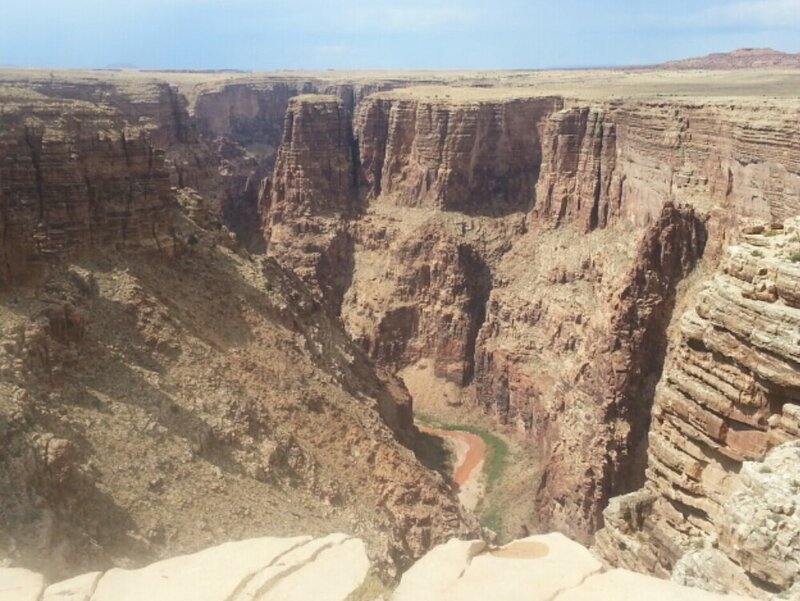 This photo was taken near the Grand Canyon, an unexpected other canyon of the Little Colorado. Rough, close, pure. I loved it! How did I miss the fact you were coming here? You are walking the same land. Welcome friend. But as you have already noticed this is a big country. You are across the continent from me, and seeing sights, I might add, that I have yet to travel too. Although I was on Rt 66 and have been to the Grand Canyon twice. Are you going to make it to Yosemite when you are in San Francisco? San Francisco is a simply lovely city. Don’t miss driving down Highway 1. Incredible scenery there. This is very true, Marion. We done a few marvellous USA road trips, and had the best fun ever. It’s an amazing country. have great adventure holidays, dear Marion…and especially greets to the NSA…carry on spying, “but not US” !!! Yellowstone is not on our list, but Route 66 is. We already found it and followed it for a bit. LOL thanks, we will, if you will too. Indeed it is Rosa, the sights, the people, very nice! Where will this trip take you after the Crand Canyon? Some day I have to go back there! It’s so beautiful! Zion is really nice too and I absolutely love San Francisco! The Secoia’s are nice too. You still have a lot of fun ahead of you. I was in Las Vegas last week for the Blackboard conference! It’s funny how they rebuilded Parijs, Venice and New York! Beautiful, the canyon is just so humbling isn’t it! Indeed, just like a massive giant dream which you just can’t comprehend. Beautiful. This world is so diverse and wonderful. i hope you get a chance to get to Utah.. The best canyons are there. I am a Canadian and was more impressed in Bryce’s and Zion than I was at the Grand Canyon.